My son loved his key chain...thank you!!!! The product is very tastefully made. It’s just as described in the ad. I got it for my son’s upcoming birthday. I know he will love it. It’s classic looking, very useful, and has such a loving reminder on it. I was apprised all during the order process when my order would arrive. I received it earlier than I even expected! I’m very pleased with the product! Thank you! I was a little disappointed in the size of the wording and keychain for the amount of money I paid. The engraved wording was so small it was hard for me to read. I did like the idea and concept of it and the time of delivery and all was good. I love the concept of the keychain; however, the delivery was way off. I orded this on July 12th for my son and still have not received the key chain yet! 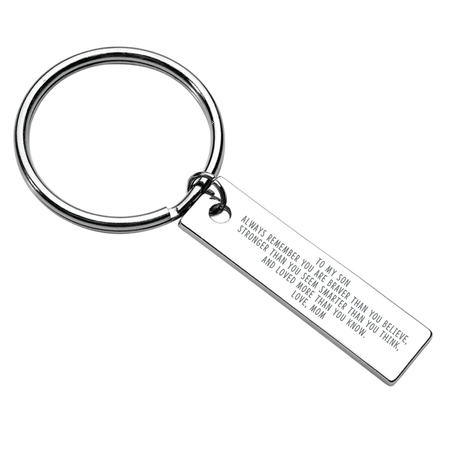 I didn't receive this keychain. I received a different one than the one I ordered.